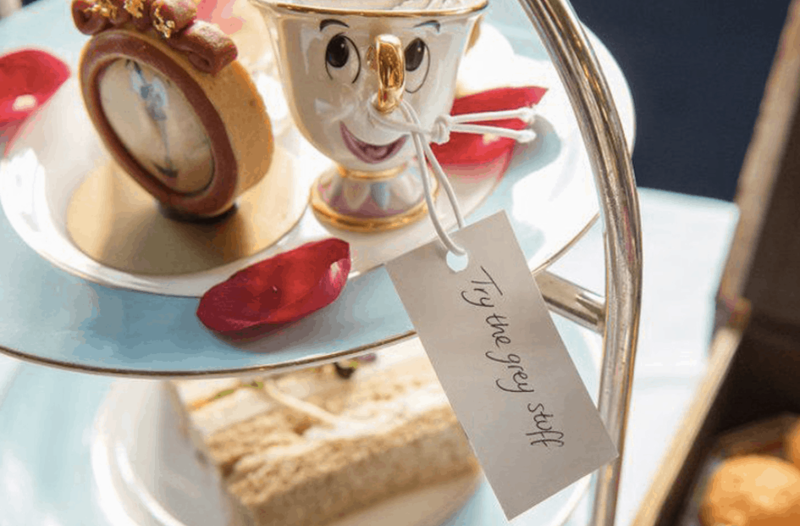 London hotels and team rooms are constantly battling to come up with the most lovely, unusual, and utterly magical afternoon tea services – and many rotate their themes frequently to keep people coming back for more. If you find yourself in London for a holiday or weekend break, you may find it hard to choose from the incredible number and variety of afternoon teas. To help you out, we've gathered up some of the most interesting and unique afternoon teas in London this year. £35 for children under 12, £45 adults, £56 or £59 depending upon champagne/cocktail selection. Vegan, Vegetarian, and Gluten-free menus are available. 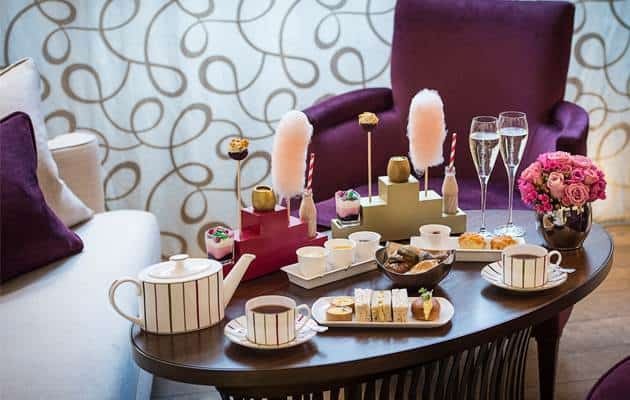 As one might expect, the two-hour Charlie and the Chocolate Factory Afternoon Tea at One Aldwych includes a dizzying array of sugary wonders. From the golden chocolate egg filled with cheesecake and mango to the homemade candy floss and bubble gum panna cotta, you'll endure no lack of sweet options. The savoury selection is equally delightful, and varied based on your dietary preferences. Even vegans – who often get sad, pared-down options – will have five savoury items to enjoy. Alcoholic beverage choices include two types of champagne or their signature “Cocktail Charlie”. £37.50 per person £49.00 with a glass of Charles Heidsieck Champagne. Vegetarian option available. Other dietary requests can be accommodated with advance request, but they cannot guarantee an allergen-free kitchen. If you're looking for something completely different from the usual afternoon tea options, look no further than The Science Tea at The Ampersand Hotel. Guests here will enjoy quirky dishes like chocolate spacemen, dinosaur biscuits, and jam in petri dishes. There's also a caramel passion fruit planet mousse and a milk chocolate fossil in chocolate soil. The Science Tea also includes standard afternoon tea items like scones, clotted cream, jam, and finger sandwiches. We were a bit surprised to see a lack of science-themed cocktails or fruity drink for kids, but this is a colorful, fun afternoon tea and you probably won't even notice. £39.50 for children under 12, £49.50 standard adult, £79.50 VIP with the addition of 2 alcoholic drinks and a premium goodie bag. Vegan, Vegetarian, wheat-free, and dairy-free menus are available, but not all options can be chosen at once. The food is not prepared in an environment guaranteed to be free of allergens. 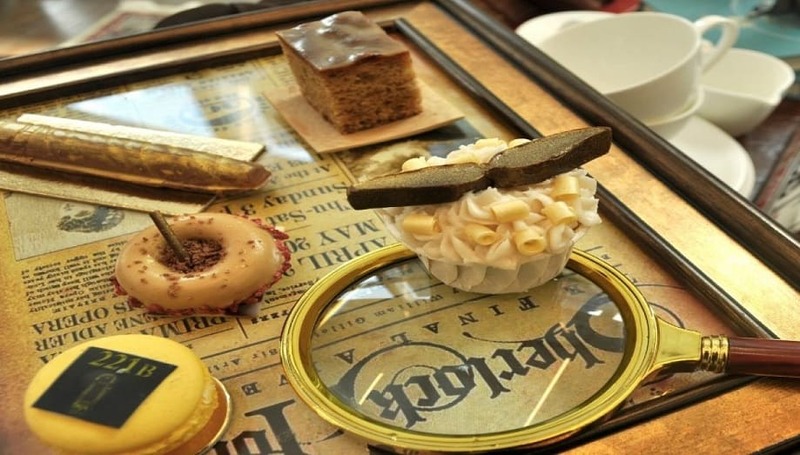 The Potion Room might just be the Harry Potter-est afternoon tea that isn't actually affiliated with Harry Potter. 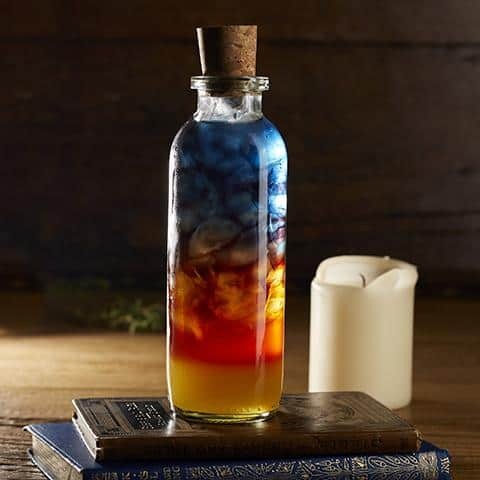 Cutter & Squidge (previously home to the Genie's Cave afternoon tea) offers up a magical 2.5 hour afternoon tea experience filled with potions, cauldrons, and a fairly hearty meal. The menu includes everything from classic scones to a Yorkshire pudding (with mushrooms for vegetarians) and a butterscotch biskie. The menu also cautions that all guests should “leave room for surprises”. The best part? The welcome drink includes unicorn tears! Or wait – IS that a good thing? I'm not entirely sure, but I'm intrigued. £35 for children under 12, £48-58 for adults depending on dates. Vegan, vegetarian, gluten-free, and dairy-free options are available. 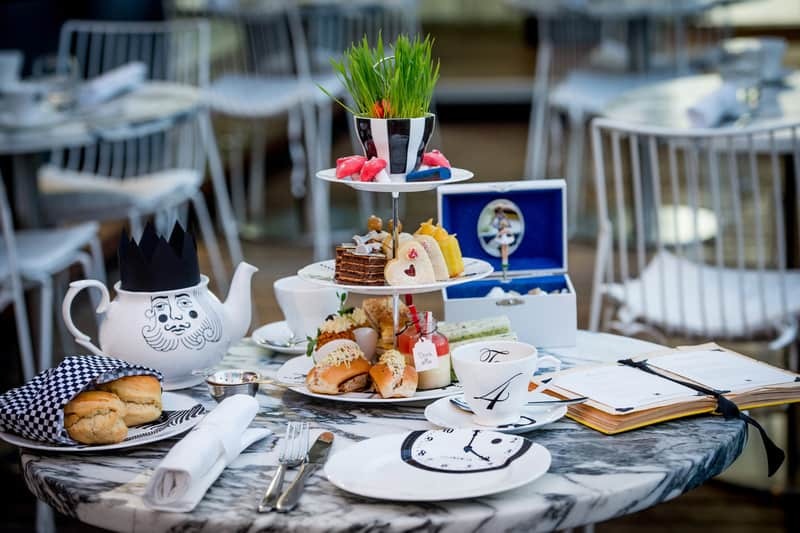 The Mad Hatter's Afternoon Tea is one of the most classic themed afternoon teas London has to offer. It's whimsical, fun, and incredibly British. 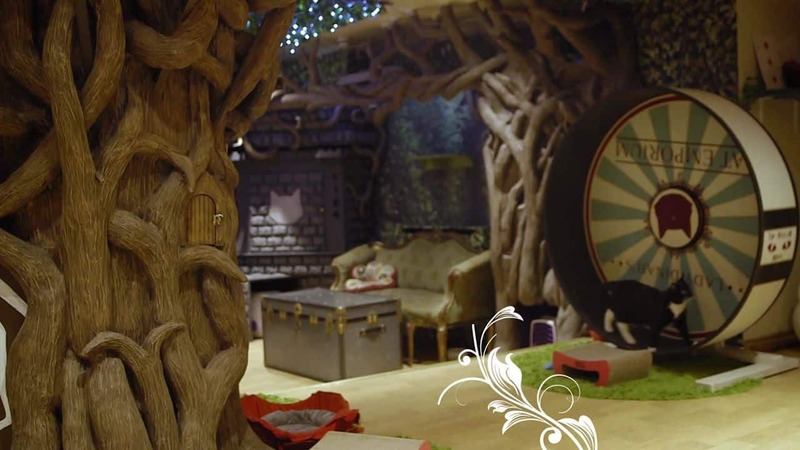 Guests enjoy Lewis Carroll-inspired treats like rose and strawberry Jammy Dodgers, Wonderland marshmallow magic mushrooms, and White Rabbit cucumber and cream cheese sandwiches. Alongside themed sandwiches and pastries, you'll also have the option to upgrade to champagne or add in Alice in Wonderland-themed cocktails. If you happen to be looking for an evening tea, they also have a Mad Hatter's Tipsy Evening Tea available. If you're looking for an afternoon tea with a more adult, masculine sort of vibe, look no further than St. James Court's Sherlock Holmes afternoon tea. You'll enjoy Mrs. Hudson's date pudding, a 221B Macaroon infused with 25-year-old scotch, and Watson's moustache (a stout cupcake), among other Sherlock-inspired treats and savoury sandwiches. Guests who like a little alcohol with their tea and scones can add a glass of champagne for £5, or an Elementary cocktail for £15. They also offer the option to purchase limited-edition hardbound copies of The Hound of the Baskervilles and The Second Stain. 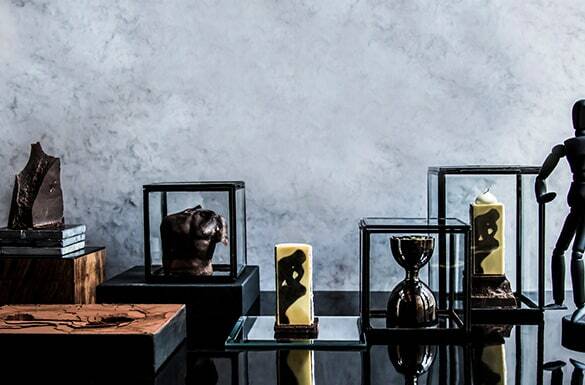 The Rodin Afternoon Tea at Rosewood London is timed to coincide with the British Museum's 2018 exhibit, Rodin & the Art of Ancient Greece. You'll be able to partake in this tea until late July. The menu includes standards like scones and finger sandwiches, alongside pastries inspired by Charles Baudelaire’s Les Fleurs Du Mal. Why Baudelaire? In the original French version, Rodin did the illustrations. Pastry chef Mark Perkins created the menu, which also includes a chocolate version of The Thinker resting against mousse and chocolate sponge. £39 with classic tea selection or £48 with free-flowing Chapel Down. 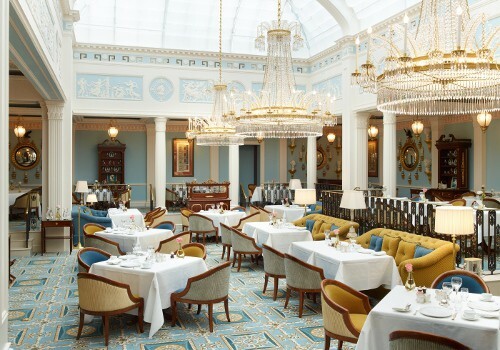 The Palm Court's Lock & Co afternoon tea is mostly your typical British afternoon tea service, except for one thing – the cakes are shaped like hats. 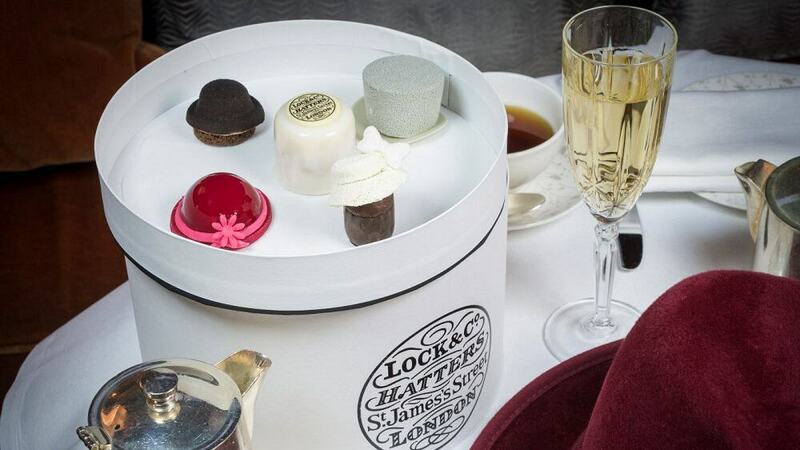 The afternoon tea service was crafted to celebrate the 340-year anniversary of nearby Lock & Co, a company that makes some of the finest hats you'll find anywhere in the United Kingdom. The menu includes a bowler filled with chocolate mousse and double chocolate biscuit, a fedora with mandarin jelly, chocolate fudge, and a red velvet cookie, and a hat box of Victoria sponge and strawberry jam (among other items). As you're eating the delightful treats, you can take comfort in the fact that they're far less expensive than an actual hat from Lock & Co. Their hats are lovely, but few of them dip down under £100 (and some of the women's occasion hats are more than £900). £38.50 per person or £50 with a glass of Champagne. Their posted afternoon tea menu does not appear to cater to special diets, but you could always phone ahead to check. The Town House at the Kensington has shown incredible attention to detail with their Tale As Old As Time Afternoon Tea. From the Chip and Mrs. Potts dinnerware to the menu with “beef ragu, cheese souffle, and pie”, it's clear someone there has watched Beauty and the Beast a time or two. Luckily, they focused on the good stuff – and not Gaston's five dozen raw eggs in the morning. The only thing that really bothered me about this one is that they don't make any special effort to cater to the increasingly large vegan and vegetarian communities. Tea is quite an easy “meal” to adapt, and it seems like most places do these days. If you're a vegetarian and you've been, let us know how it went. £25 per person. Offers options for gluten-free and vegan guests (along with a number of less restrictive variations). London's longest-running cat cafe now offers the traditional afternoon tea service – with cats. While their food offerings are fairly standard, what really makes this afternoon tea stand out is the fact that you get to take your tea surrounded by cats. What could be better than that? Lady Dinah's is an absolute kitty heaven, but this 1.5 hour tea experience is probably not well-suited to those with cat allergies or an aversion to the odd stray hair. £39 per person or £49 with your choice of a glass of champagne or a margarita. This Mexican-influenced afternoon tea was inspired by the Frida Kahlo exhibit currently on at the Victoria and Albert Museum, and they even include margaritas as an alcoholic beverage option. As with many themed afternoon teas, this is a temporary option, starting in May 2018 and continuing until an unknown conclusion date. This afternoon tea does not mention any accommodations from vegans, vegetarians, and the gluten-free. Phone ahead or skip this one if that's an issue for you. Which Afternoon Tea Would You Choose? If you're in London this summer, be sure to make time for an afternoon tea. There's nothing quite like traditional British tea service, and these are some of the best. Which would be your choice?